Video game stage plays sound like the most bizarre thing in the world, and yet, also the coolest. Earlier this year, a stage play based on Sega’s Golden Axe series was announced for later 2018 by theater group Spiral Chariots. Not to be outdone by Sega, Capcom has announced a Devil May Cry stage play for 2019. 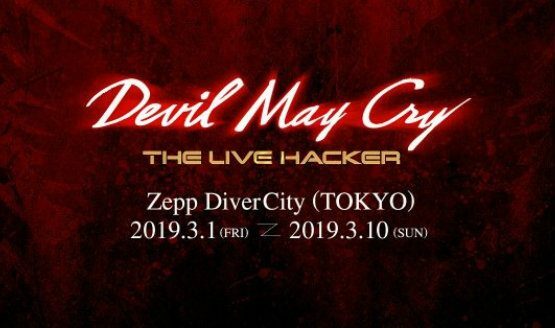 Titled, Devil May Cry: The Live Hacker, this event will be running in Japan in March 2019, which also happens to be around when Devil May Cry 5 is set to launch in the video game world. The play will run from March 1 through March 10, 2019, for a total of 13 performances at the Zepp DiverCity venue in Tokyo. Directed by Jun Yoriko (who was also at the helm of a 2015 Resident Evil stage play called Biohazard: The Stage), Devil May Cry: The Live Hacker will also feature Ryoma Baba as Dante, KwangSoo as Gideon, Ami Maeshima as Elise, Yuki Nakayama as Henry, Tomoya Yamaguchi as Owen, Takuma Sueno as Luke, and Jun Shirota as Muul. Noah, Liam, and Lady are also character who will appear in the show, but do not have casting announcements yet. Devil May Cry: The Live Hacker does have an official website, which contains information on the show, the cast, and ticket sales. It’s all in Japanese, of course.